1STPLAYER Laptop Air Extracting Cooler with ITC, Visual Interactive Interface,double Ball Bearing(USB) by 1ST PLAYER at Pacs BG. Hurry! Limited time offer. Offer valid only while supplies last. 1STPLAYER was born for creating a unique and ultimate gaming experience for global ambitious gamers. It never stops its step in pursuing extreme. 1STPLAYER was born for creating a unique and ultimate gaming experience for global ambitious gamers. It never stops its step in pursuing extreme. Adopted by the up to date MCU Intelligent Temperature Control Technology, Visual Interactive Interface, powerful radiating & power output, the double ball bearing fan and the superb industrial design, the new born BLACK SIR will lead the enthusiastic gamers with gaming/e-sport laptops to be unbeatable in the e-sport world. MCU ITC (Intelligent Temperature Control)：With MCU ITC, the MCU tests the current temperature of the notebook precisely, then instantly adjusts the signal source and transmits it to the signal receivable air blower. By intelligently control the RPM according to the temperature of the notebook, the heat is reduced. Power Output：The 12V AC input Offers powerful radiating effect with maximum 5000 RPM. The real db can be controlled within 45db under 4500RPM. Visual Interactive Interface：With the visual interactive interface, users can visually grasp the operation condition of the notebook and the radiator. 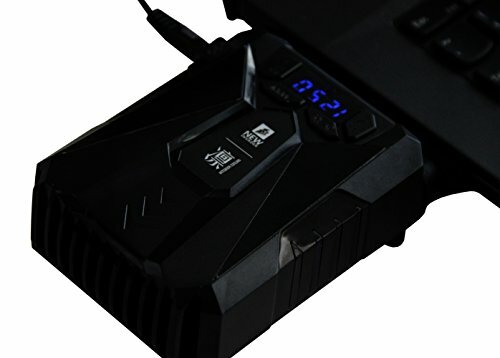 Users can switch among different modes according to the Temperature and the RPM shown in the screen. Double Ball Bearing TC (Temperature Control) Fan：The first-adopted Double Ball Bearing fan is with lower db and 5-8 years longer lifetime than the Sleeve Bearing fan. Aluminum Heat Conduction, Purity high as 99%：Different from the common Aluminum or plastic heat conduction, for better conducting the heat, the Aluminum with 99% purity is employed in the cavity. The overall optimized cavity housing and parts combination offer our customers better heat conduction experience. If you have any questions about this product by 1ST PLAYER, contact us by completing and submitting the form below. If you are looking for a specif part number, please include it with your message.